The Nimbus 28DC&nbsp; is a stylish cruiser with a large social cockpit and is a rare example. This model Nimbus is their more sporty version with a large social cockpit and no trademark rear cabin. 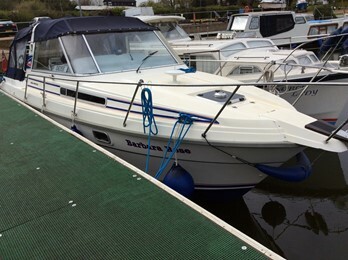 The craft offers 4 berths within the cabin with berthing forward and a quarter berth extending under the cockpit. The U shaped seating in the cockpit creates an extra double berth if required. The craft have a powerful diesel engine and outdrive.